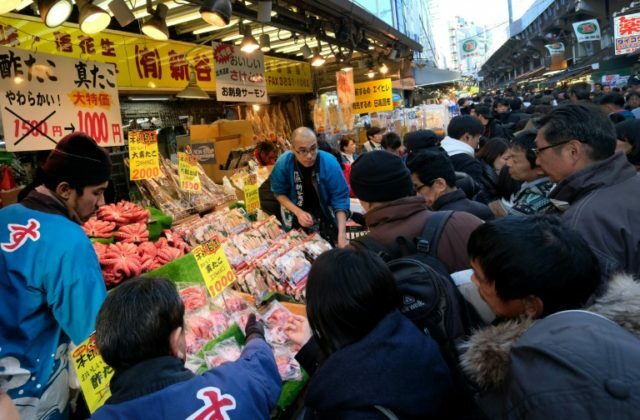 Tokyo (AFP) – Japanese consumer prices rose a sluggish 0.9 percent last year, according to government data published Friday, as the world’s third-largest economy continues its years-long battle to stoke weak inflation. The annual figure is far below the central bank’s inflation target of two percent, and come as the Bank of Japan (BOJ) is reportedly preparing to revise down the country’s inflation forecast next week. The BOJ will lower its inflation forecast for the year to March 2020 to around one percent from the current estimate of 1.4 percent in its quarterly report, reflecting falls in crude oil prices, local media have reported. This would be the latest in a string of downward revisions. In October, the central bank also lowered its inflation forecasts, in the latest sign it had failed to make headway towards its two-percent target despite years of massive monetary easing. Japan has battled sluggish inflation for many years and the central bank’s ultra-loose monetary policy appears to have had limited impact. Low inflation — or even deflation where prices are falling — is considered bad for the economy as consumers put off purchases expecting cheaper goods in the future. This in turn stunts growth. In an attempt to stoke inflation, the BOJ has implemented an ultra-low monetary policy and Governor Haruhiko Kuroda has repeatedly said he is not looking for an exit from this strategy, even as other central banks around the world begin raising rates. For the monthly inflation data, prices in rose by 0.7 percent year-on-year, slightly lower than a 0.9-percent rise in prices in November. With fresh food and energy stripped out, prices rose by even less — just 0.3 percent year-on-year in December.